The market may no longer tolerate rising ASPs. One factor that is likely suppressing the smartphone market is price. We see several indications the market elasticity is falling. Obviously, Apple’s iPhone ASPs have climbed from $645 in FY16; we model $742 in FY18. We do not believe it is coincidence that the highest end of the product portfolio, the X, is the model that is flagging. Sources inside Apple’s Asian manufacturing supply chain paint a much gloomier picture than Cook. This period of flat or declining sales is likely to continue for much of the rest of the year. "The iPhone X didn’t sell well during the holiday season," they said. "We didn’t get as many 1Q orders as previously anticipated." The ASPs were high during 4Q because of the X, but ASPs will decrease during the March quarter, since the share of the X has gone down. Every major phone's successor last year was more expensive than the previous edition, sometimes drastically so, raising the average year-on-year price significantly, to the highest ever. We aren't even including Google's own phone line, which used to be the best value-for-money before the search giant decided to vertically integrate, and we are now left with a Pixel 2 XL that costs north of a thousand euros, for instance. There are plenty of reasons which can be cited for that jump, and corporate greed is not even highest on the list - 2017 flagships got drastically overhauled in terms of design and materials used, 18:9 HDR displays became obligatory, and the basic storage amounts got bumped. 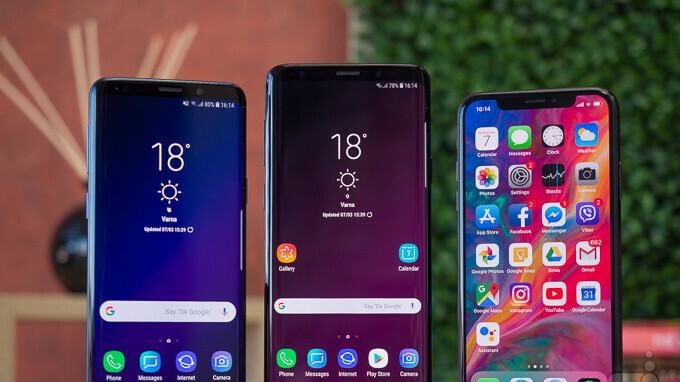 Still, there are indications that this unpleasant trend of ever-rising smartphone prices may continue this year as well, but people are apparently already at the limit they are willing to spend on a handset, which could very well backfire, if you are a top tier maker. Consumers are smart.They no longer want to pay high price for their daily driver,which they are gonna change after every 2-3 years. They're predicting 8 to 12 million in one quarter. That's still a pretty high number. Awareness is key , earlier the lower end spectrum of phones just wasn't good enough in terms of quality, features and specs. Today , the mid range just about does every single thing decently well enough that there is no real use to 90% of the population to spend a really high amount of money of a camera which is 10% better or the speed which most people don't need. Consumers aren't smart. In fact they are pretty dumb. They let Samsung and Apple get away with this s**t in the first place. There is no reason a smartphone should be this expensive. I am glad there are alternative with the Chinese manufacturers. "There is no reason a smartphone should be this expensive." Why not? Your smartphone can replace many products and you use it hours every single day for many different tasks. It's like mini computer in your pocket with great camera. Why it has to be cheap? "I am glad there are alternative with the Chinese manufacturers." Yeah, you pay what you ask for, good luck waiting new OS versions and good luck with security and all too. "Yeah, you pay what you ask for, good luck waiting new OS versions and good luck with security and all too." Enjoying Oreo on my "cheap" Mi Mix2 and it will be updated regularly for many years to come. The way things are turning out it's safer to use a Chinese smartphone than Facebook these days. Pick your poison. Tech products historically decline in price as they mature, and they certainly have matured. It's why people are disappointed every year that there are no longer new revolutions with each new release like there was around 2010-2012 or so. Yet prices keep going up and the sales are declining. It's basic economics; prices go up and sales go down. There are formulas for the sweet spot of maximizing profit, but I think they are misjudging, or at least for the consumer's sake, I hope they are. I paid $700 for a Lenova Yoga 720 and it is far more capable than my phone (minus the camera), so paying more for a phone is rather difficult to justify for me and I doubt I am alone in that thinking. Good news. Ripping off customers has never worked for any company, except Apple, but even their customers have a limit. My guess is that we will continue to see high prices for "flagships". Market for high-end units is saturated, we won't see sales numbers like we did with iPhone 6 or in Samsungs case the S4 again. People use their phones for longer period of time now. Companies will likely want to compensate for that by keeping prices high. iPhone X is a proof that it works, people (me included) still buy them even though the price is quite a bit higher than previous models. Weak demand doesn't increase the products value, that's not how economics works, so this downward trend isn't exactly a shock. Whether the overall profit is better for the manufacturer's is the question. What are they talking about, iPhone 8, 8+ and X combined sales are already easily over 100 million, it's not bad at all. Why people only talk about X sales when Apple released 8 and 8+ too, of course those are eating X sales too because everyone have different taste, some one X some want 8 or 7 etc. There will always be someone in denial. If PhoneArena say that iPhone X sales have taken a nosedive, things but be really bad for the fruity firm. iphones are the most boring phones ever! Im pretty sure you're boring as hell too, maybe you can't even satisfy your girl either, so you spend your time here bashing apple. What a sad sad rebuttal. He really hurt your feelings didn't he? He was talking about Apple, which is a company. You're acting as if he insulted your mom, calm down kid. I for one bought iphone X and gave me galaxy S8 to my wife. But this will be my phone for at least for 3 years. So i see it as a long term investment because in fact apple will update their devices for at least for 5 years. Drop it once and it's not such a long term investment anymore. Phone are simply getting too expensive. I plan to keep my Note 8, and go two a two year upgrade cycle, it's getting ridiculous. Agree Darkk But I am already excited about the note 9. Me too, but it's gotta really wow me sis. I just bought a new Corvette, so friggin Snickers bar would have to wow me right now lol. Gotta be tight with the money for a while. Oh cool, love Vettes We are talking about getting the Grand Cherokee srt Hellcat. I am excited about it but agree it depends on what more it has then the note 8. Hellcats rock. If it's worth giving up my Note 8, that would be a major phone. Phones have gotten so good that it is tough for me justify replacing my Note 8. Just put in a battery in the gf's S7 Edge as I have not seen a device that does anything exceptionaly better. And the money I will save between not updating devices this year will pay for a good chunk of snowblower I have an order.